Finding diamonds in meteorites made scientists think seriously about how they might occur in space. This artist's concept shows a multitude of diamonds next to a hot star. Image by NASA/JPL-Caltech. Diamonds may be rare on Earth, but surprisingly common in space -- and the super-sensitive infrared eyes of NASA's Spitzer Space Telescope are perfect for scouting them, say scientists at the NASA Ames Research Center in Moffett Field, Calif. Using computer simulations, researchers have developed a strategy for finding diamonds in space that are only a nanometer (a billionth of a meter) in size. These gems are about 25,000 times smaller than a grain of sand, much too small for an engagement ring. But astronomers believe that these tiny particles could provide valuable insights into how carbon-rich molecules, the basis of life on Earth, develop in the cosmos. Scientists began to seriously ponder the presence of diamonds in space in the 1980s, when studies of meteorites that crashed into Earth revealed lots of tiny nanometer-sized diamonds. Astronomers determined that 3 percent of all carbon found in meteorites came in the form of nanodiamonds. If meteorites are a reflection of the dust content in outer space, calculations show that just a gram of dust and gas in a cosmic cloud could contain as many as 10,000 trillion nanodiamonds. "The question that we always get asked is, if nanodiamonds are abundant in space, why haven't we seen them more often?" says Charles Bauschlicher of Ames Research Center. They have only been spotted twice. "The truth is, we just didn't know enough about their infrared and electronic properties to detect their fingerprint." To solve this dilemma, Bauschlicher and his research team used computer software to simulate conditions of the interstellar medium--the space between stars--filled with nanodiamonds. 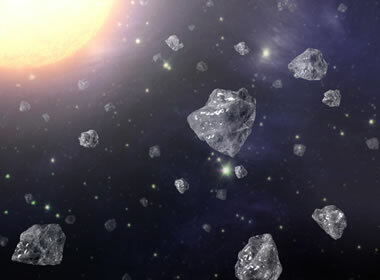 They found that these space diamonds shine brightly at infrared light ranges of 3.4 to 3.5 microns and 6 to 10 microns, where Spitzer is especially sensitive. Astronomers should be able to see celestial diamonds by looking for their unique "infrared fingerprints." When light from a nearby star zaps a molecule, its bonds stretch, twist and flex, giving off a distinctive color of infrared light. Like a prism breaking white light into a rainbow, Spitzer's infrared spectrometer instrument breaks up infrared light into its component parts, allowing scientists to see the light signature of each individual molecule. Team members suspect that more diamonds haven't been spotted in space yet because astronomers have not been looking in the right places with the right instruments. Diamonds are made of tightly bound carbon atoms, so it takes a lot of high-energy ultraviolet light to cause the diamond bonds to bend and move, producing an infrared fingerprint. Thus, the scientists concluded that the best place to see a space diamond's signature shine is right next to a hot star. Once astronomers figure out where to look for nanodiamonds, another mystery is figuring out how they form in the environment of interstellar space. "Space diamonds are formed under very different conditions than diamonds are formed on Earth," says Louis Allamandola, also of Ames. He notes that diamonds on Earth form under immense pressure, deep inside the planet, where temperatures are also very high. However, space diamonds are found in cold molecular clouds where pressures are billions of times lower and temperatures are below minus 240 degrees Celsius (minus 400 degrees Fahrenheit). "Now that we know where to look for glowing nanodiamonds, infrared telescopes like Spitzer can help us learn more about their life in space," says Allamandola. Bauschlicher's paper on this topic has been accepted for publication in Astrophysical Journal. Allamandola was a co-author on the paper, along with Yufei Liu, Alessandra Ricca, and Andrew L. Mattioda, also of Ames.